Heat and humidity: no, not the 2012 NBA Finals matchup (that’s Heat vs. Thunder, which kinda sounds like the title of a movie based on a comic book), just the relentless weather from now until, oh, October…so summer foods aren’t fashionable but are rather a biological necessity in my kitchen. This time of year, I crave cucumbers, tomatoes, lettuce, cold soba noodles, bun thit nuong, and iced coffee, and I really look forward to a big bowl of gazpacho. Recent rains kicked my garden into overdrive. 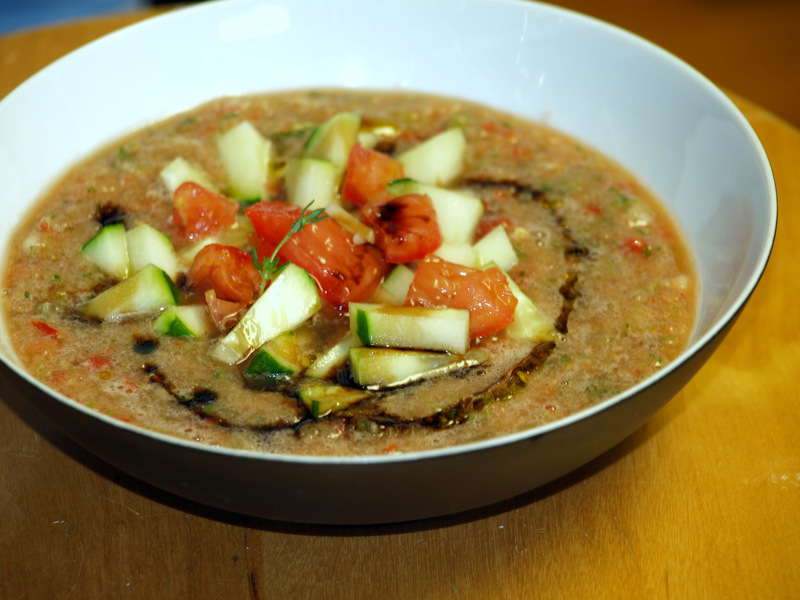 Tomatoes, cukes, zucchini, peppers, and herbs burst out of their raised beds, requiring daily picking to keep up with production and making gazpacho the easiest summer dish to prepare. Here’s my non-recipe: gather fresh produce. A couple of very ripe tomatoes, one large or a couple of small cucumbers, one or two red or green peppers, a single jalapeno, zucchini if you can stand eating another one, a handful of parsley, a few leaves of tarragon/basil/mint/oregano/chives: in essence, anything growing in the garden that can be eaten raw. Trim the vegetables of any chewy bits (stems, tomato cores, some of the cucumber peels) and coarsely chop. Reserve a tablespoon of veg chunks per serving as garnish. Put everything else into a blender, Magic Bullet, or food processor. Whiz until roughly pureed, adding a touch of salt. To get fancy, add a handful of fresh bread crumbs or a few slivered almonds and puree a bit longer. Spoon the puree into bowls, top with the reserved chopped vegetables, and drizzle a little olive oil and balsamic vinegar into each bowl. Eat immediately, enjoying summer’s produce, preferably while sitting in an air-conditioned kitchen.